This item is available for pick-up or purchase in-store ONLY. Garant TIFS600TC True Temper 6 cu.ft. Industrial Wheel Barrow (Unassembled) is an industrial grade wheelbarrow, 6 cu. ft. high visibility, rolled edge seamless steel tray, welded tray clips, funnel tray with easy pouring lip. 54 in. Garant TIFS600TC True Temper 6 cu.ft. 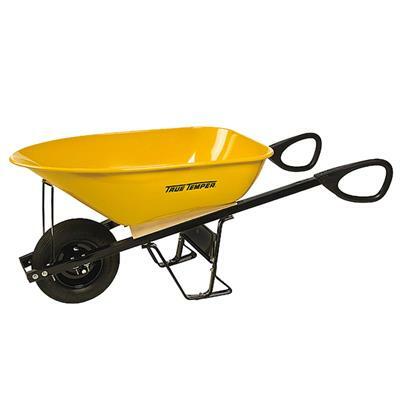 Industrial Wheel Barrow (Unassembled) is an industrial grade wheelbarrow, 6 cu. ft. high visibility, rolled edge seamless steel tray, welded tray clips, funnel tray with easy pouring lip. 54 in. strong steel handles and Ergoloop poly grips for a maximum control and comfort, 4-ply 16 in. (40.6 cm) pneumatic tire with inner tube, oversized 3/4'' (1.9 cm) steel axle and roller bearings with zert fitting. Heavy-duty undercarriage with tray braces, leg stabilizers, stays and leg shoe pads.